The bleak post-apocalyptic America of Cormac McCarthy's novel is very well translated to the screen (but low in the uplifting department). A man and his young boy roam the decimated landscape with hardly any resources - survival at the core of their driven quest. The biggest danger they face is in fact other people. With food (and water) scarce, the sparse surviving population has to resort to desperate measures. But the father and son refuse to go that route. Clinging onto the threads of their sanity, their slow, arduous and seemingly futile mission pulls you in, the dread of fatal danger always on the horizon. 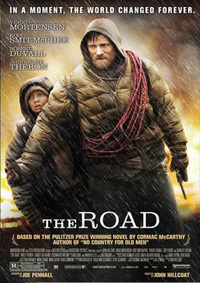 The Road is a dark and intense experience set in motion by the stupidity of man and its potential dehumanizing consequences, and illustrating the bonds between father and son, fused with the struggle of a few survivors striving to hold on to their humanity.